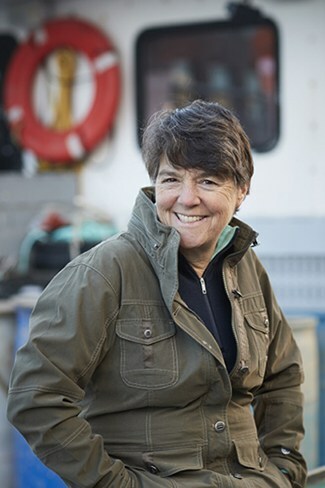 Linda Greenlaw, America’s only female swordfishing captain, is author of five bestselling nonfiction books about life as a commercial fisherman: The Hungry Ocean, The Lobster Chronicles, All Fishermen Are Liars, Seaworthy, and Lifesaving Lessons, as well as the Jane Bunker mysteries: Slipknot, Fisherman’s Bend, and Shiver Hitch. She has also authored two cookbooks with her mother, Martha Greenlaw: Recipes from a Very Small Island and The Maine Summers Cookbook. She is the winner of the U.S. Maritime Literature Award in 2003, and the New England Book Award for nonfiction in 2004. Time Magazine called her 2005 Recipes from a Very Small Island, co-authored with her mother Martha Greenlaw, a “must-have cookbook”. Linda is featured in the hit Discovery Channel series Swords: Life on the Line. Greenlaw first came to the public’s attention in Sebastian Junger’s The Perfect Storm, where Junger called her “one of the best captains … on the entire east coast.” She’s also been featured on Good Morning America, Today, CBS Sunday Morning, The Martha Stewart Show, and National Public Radio. She splits her time between Isle au Haut, Maine, and Surry, Maine, with her husband, boatbuilder Steve Wessel.